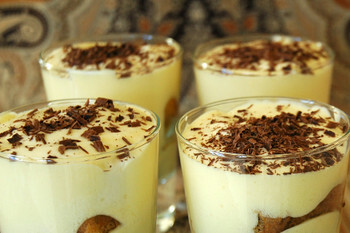 The last time I made Ile Flottante we lived by the beach and I would stand at the stove looking at the ocean while stirring the Creme Anglaise . They are sometimes called Snow Eggs or Oeufs a la Neige . When I've made them in the past I have poached the egg whites in the vanilla infused milk which is then used to make the Creme Anglaise. Time consuming and messy. Which is why I haven't made them in years. 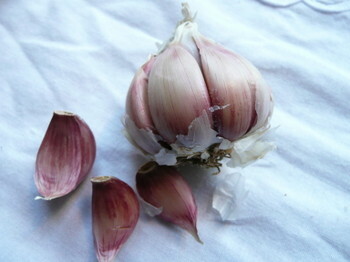 I've been watching the series French Food at Home with Laura Calder. Her version bakes the meringue in the oven. So easy. The recipe is a combination of Laura's recipe and a recipe from the Essential Dessert Cookbook, a birthday gift from my son. In a medium saucepan heat milk with the vanilla bean. Do not boil. Whisk eggs yolks with 2/3 cup caster sugar in a medium bowl. Slowly pour hot milk on egg yolks stirring until blended. Return mixture to saucepan and stir over low heat until the custard thickens and coats the back of a wooden spoon. Do not boil the custard or it will curdle. Remove from heat and pour into a jug bowl and leave to cool. Lightly grease 4 x 1/2 cup ramekins and sprinkle with caster sugar. Beat egg whites to soft peak stage. Slowly add the remaining 1/3 cup caster sugar and whisk until stiff and glossy. Ladle into ramekins and smooth off the tops. Bake in oven for 20 minutes or until puffed and golden. Place a meringue on serving dish and pour the cold custard around. Stir the extra sugar with two tablespoons of water in a small pan over low heat until the sugar dissolves completely. When the sugar has dissolved bring to the boil and simmer until syrup turns golden brown. Working quickly and carefully drizzle the toffee over the meringue and custard. This is my entry for Waiter There's Something In My Sauce. Thanks Andrew for hosting and thanks for delaying the closing date for entries. Tags: Iles Flotantte, Ouefs a la Neige, snow eggs, Waiter Theres Something In My Sauce. Lynn at Café Lynnlu , the winner of last months Hay Hay Its Donna Day - Sorbet, has announced Gnocchi as the theme for the latest Hay Hay Its Donna Day. Here is the recipe. 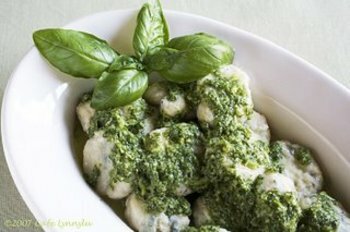 * The gnocchi should be homemade and can be a main dish, salad, side or dessert. You can use any ingredient, such as cheese, potato or any other vegetable or fruit to make the gnocchi. *Post your recipe no later than August 18, 2007. 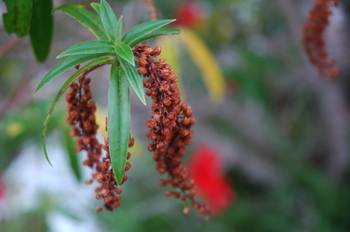 When you post, send an email with the HHDD #14 in the subject line to staranise.ld[at}gmail[dot]com. Include your name, the name of your recipe, your location, the name of your blog and the permalink to your post. *Round-up posted and voting begins on August 25, 2007. *Voting closed and winner announced on September 1, 2007. Over at Baking and Books Ari is raising funds for the Hazon Foundation 2007 NY Jewish Environmental Bike Ride with a raffle of cook books. There are two Donna Hay books "Instant Entertaining" in the raffle . Other wonderful books being raffled include books from Nigella, Jamie and David . Only one more day of Le Tour and I'll find me way off the couch and back into the kitchen. For the past 19 days I've been recording the race during the night. The next morning I get comfy on the couch and watch the race for the next 5 - 6 hours. I feel no guilt. As I keep telling the family I'm recovering from surgery, it's winter, it's too wet, too cold, it looks like rain. There is no way I can go out in this weather. Last weekend the sun was shining, so we went out for the day and I watched the race when we arrived home. I went to Arfi's for lunch. Arfi always has foodie gifts for me to bring home. This time - her Tamarillo Chutney , and because the fruit trees were bare and the veggie garden empty, a dozen eggs laid by her own hens. 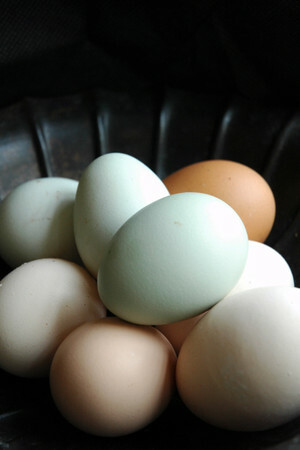 Lovely farm fresh brown white and blue eggs. I have plans for them and if I manage to find the kitchen on Tuesday I'll be entering Waiter, There's Something In My Sauce. I've done this meme before but it was called the 4 x 8 last time. I could say no but when my new New Zealand Italian blogging friend Marina passed it on, and she is such a lovely person, I decided to play. Club Med Lindeman Island where my son is working. R & S's garden on the Gold Coast having breakfast, reading the papers and deciding where to go for lunch. Walking the Camino in Spain and about to arrive into Leon where there is a really nice wine bar near the cathedral. Running a half marathon anywhere in the world. I'm going to keep this in New Zealand and pass it on to Gilly. Congratulations to Lynn. 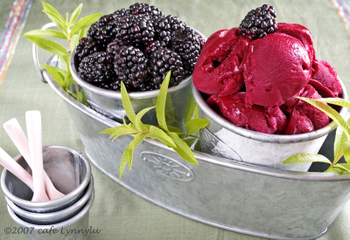 With this gorgeous Blackberry Lemon Verbena Sorbet she has won the thirteenth edition of Hay Hay Its Donna Day. We will be announcing Hay Hay Its Donna day #14 very soon. Thank you to Laura at Eat Drink Live for hosting the sorbet edition of Hay Hay Its Donna day. I'd like to thank everyone who left comments on my post about the word foodie and also thank you to those who emailed me personally . It does surprise me a word can invoke such passionate responses. It appears people actually hate the word, and I hope I'm right in saying, not the foodie him/herself. Although my research did bring up a blog with a scathing post on a man driving a Mercedes with the personal number plate FOODIE and some quite hateful comments from the readers. This might be a good time to reveal I drive a 15 year old car with a personal number. Can you guess? Well WINO was already gone so I have FOODIE. And I love it. I can't tell you the number of people over the years that have approached me in the car park of various foodie food outlets and asked to buy it. All appeared quite normal. Food loving normal people. And I could never remember a number plate which consisted of a series of random numbers and letter. Perhaps it's an age thing. After all I've been using the word for a good twenty or so years to describe people who are passionate about food and where it comes from. I've never attached any sort of elitist meaning to the word. Although Ed attaches an entirely different meaning to the word - almost the opposite of elitist. English is an evolving language and over the years the meaning of a word can change entirely. Take the word gay. Fifty years ago it meant carefree, twenty years ago it came to mean sexual orientation and now today I have heard the current generation to use it as meaning something they don't like. Perhaps this has happened to the word foodie and todays meaning is entirely different to twenty years ago. I tried to think of a word I dislike, hate, despise. Nothing came to mind. I thought of words like war, poverty, bullying, mean spirited. I dislike, hate and despise what they portray, but I don't actually hate the word. They are just words. This will be my last comment on the word and I have no problem with people continuing to express their opposition. Constructive debate is always healthy. I only ask you think carefully how you word your opposition. I'm a sensitive soul a bit of a wimp and did find some reactions quite hurtful. I will leave you with a final comment from Jennifer, a blogger who's writing I admire, and seems to sum it up perfectly. I think it's a fun word, and rather tongue-in-cheek, because if you can call yourself a foodie, you can also giggle over the so-called pretentiousness of the whole concept of being food-obsessed, and therefore it isn't pretentious at all. We met seventeen years ago and I still remember our first conversation. It was about a book called The City Of Joy by Dominque Lapierre. It is surprising we became friends as we were so different. Where she teased her hair into curls, I gelled mine into spikes. She wore pretty little dresses and taught literature at a girls school, I wore black and was a stay at home Mum. She served her roast lamb with potatoes and gravy, I served mine with roasted capsicum and pomegranate vinaigrette. She watched TV seated nicely in a chair, I sat with my feet tucked under me. Her children studied law and marketing, mine studied music and film. She was ruled by her head, I let my heart make my decisions. I think she saw in me a little of the off beat person she'd like to be, I know I saw in her a little of the more conservative woman I'd like to be. Our friendship grew, fuelled by a mutual love of travel, literature and film. We went on holidays together, sometimes with our husbands, sometimes without. One year we spent a month in France. In Paris she took me to Printemps, I took her to Dehillerin . We spent a week driving through Provence in our little red rental car. Our first night in Monaco we got drunk as we celebrated surviving a week of driving on the wrong side of the road . We went into Italy to the markets at Ventimiglia. She took an hour to choose 1 pair of leather gloves, I bought 4 pairs in 10 minutes. She carried a secret. A secret about a lost love. She moved overseas to take up an exciting teaching position in a large corporation. I made plans to visit. We looked forward to discovering Tong Li together. Then came her phone call, she was unwell, she had been flown by private jet to a Hong Kong hospital. Next a phone call from her son, she would be having surgery for a brain tumour, could I come to Hong Kong. I spent a week in Hong Kong supporting her children and helping where I could. One night her daughter and I filled her hospital room with candles, music and rose petals. The doctors came in and blew the candles out with warnings about oxygen cylinders and fires. We all flew home to New Zealand and she came and lived with us while undergoing further treatment. 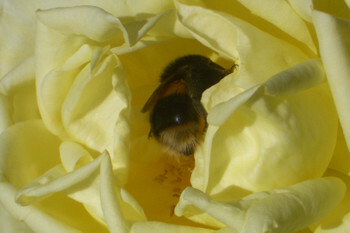 The day came when I realised she needed more care than we could give. Eventually she was moved to a hospice. Every day I would go for my morning walk stopping off at the hospice to visit her. She knew she was dying. 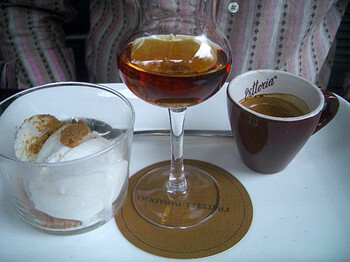 On the day the doctors told her I poured us each a glass of Grand Marnier. We sculled the drinks and threw the glasses into the fireplace, smashing them into tiny shards. The lost love was on her mind. I could see she was troubled and I encouraged her to talk about it. I felt it would help her let him go. She promised she would tell me the story when she was ready. One day I missed my morning visit to the hospice. It was after lunch when I arrived. She began to talk about the lost love. I could see how painful it was for her. I reached over and hugged her and said I don't need to know. We hugged and cried, we both knew it would be our last conversation. That night she slipped into a coma and was soon gone. 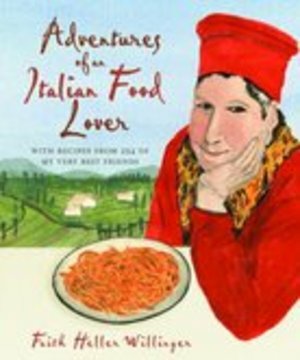 When Cath invited me to participate in the Adventures of an Italian Food Lover event about friendship I had a feeling this friendship would stand out and would be the one I chose to share. It was when I came to Faith's memories of her friend Zia Enza Tarli I found my friend in the sentence "She's an expert on family traditions, knows about obscure Italian holidays and festivities". I knew then it would be Zia's Tiramisu I would make. Thank you Cath and Ivonne for inviting me to be part of this memorable event. I look forward to reading the friendship memories of my fellow bloggers. Amanda's philosophy on food mirrors mine - Figs Olives Wine embraces a Mediterranean cultural style of eating through the use of seasonal, local produce and through simple, unadorned cooking that highlights the quality of ingredients rather than the skills of the chef. It is an honour to be chosen for this award by Amanda. I now have the opportunity to also nominate bloggers I believe are helping move the world in a positive direction. Because my own award was based on my Taste of Yellow in support of LiveSTRONG Day I have decided to nominate people who have used their blog to promote health issues. Kalyn's Kitchen - Kalyn brings to food blogs the healthy answer to obesity with the lower glycemic diet. Homemades - Arfi , suffers from iron deficiency anaemia and raised awareness of the condition with her Cook and Eat Meat event. Mele Cotte - Chris, a cancer survivor, raised awareness of a healthy diet to prevent some cancers with her event Foods to Combat Cancer. Although they have already been nominated by Amanda I'd like to second the nomination of Ilva and Joanna who have combined to promote healthy eating on their blog The Heart of the Matter. Thank you Amanda for the honour and thank you to all bloggers contributing toward a healthier world, especially Kalyn, Arfi, Chris, Ilva and Joanna. Should they wish, nominees may now proudly display the BPGC badge on their blogs. If any nominees have someone in mind that they’d like to nominate in turn, just be sure to pass this list of rules to the blogs you are tagging. 1. When you get tagged, write a post with links to up to 5 blogs that you think are trying to change the world in a positive way. 2. In your post, make sure you link back to this post so that people can easily find the exact origin of the meme. 3. Leave a comment or message for the bloggers you’re tagging, so they know they’re now part of the meme. 4. Optional: Proudly display the “Bloggers For Positive Global Change” award badge with a link to the post that you write up. A rest day on Le Tour, Robbie is out and I no longer have a favourite rider, so time to catch up on a bit of blogging and blog reading. 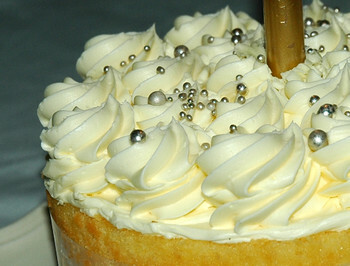 This is the yummy birthday cake I enjoyed last night. Bryan had told me he would be ordering Thai takeaways for dinner but he was keeping a secret. Just as I was starting to wonder where the Thai takeaways were my lovely friends Dale and Sylvia arrived with a three course birthday dinner complete with birthday cake and wine. Then our neighbours Mark and Jenny called by with another cake and we opened more wine. Thank you to everyone who dropped by and left birthday wishes...and special thanks to Bron for the lamingtons . 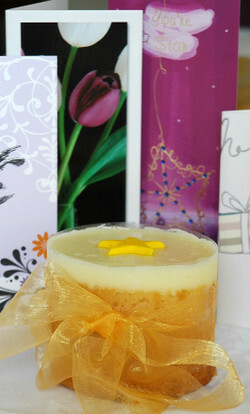 Laura at Eat Drink Live has posted the round up of the sorbet editon of Hay Hay Its Donna Day . Check it out and cast your vote before 22nd July. Some of the special people in my life were born in July. A favourite aunt, a special cousin...and his wife, two good friends (both called David), my hairdresser, Arfi and her daughter, Fred , Mary and her significant other, Reinaldo Arenas , and the best of all......my husband, Bryan celebrated his birthday yesterday. Today it's my birthday which I share with fellow blogger Mary. Mary came to stay with us for the weekend and became head chef and assistant dish washer. We invited Marina over to help celebrate a Bastille Day dinner with us. Marina brought along her wonderful chocolate pear tart for dessert...and her delightful husband. With the wine and conversation flowing I forgot all about the camera so sorry but no photos to share. I'll be spending the morning on the couch watching last nights recording of Le Tour . Go Robbie . Update: I almost forget. I also share my birthday with my friend Richard who rang me this morning to wish me happy birthday and swap birthday dinner plans. I treated myself to a new point and shoot Panasonic Lumix DMC-TZ3 camera recently. This photo was inspired by a photo taken by the talented Ilva at Lucullian Delights . I have a nice couple of days ahead. Mary is coming to visit for the weekend. We plan on celebrating Bastille Day with Marina. So that will be a New Zealander, an Australian, two Italians and a Canadian celebrating the French national day with New Zealand lamb and Australian and New Zealand wines. 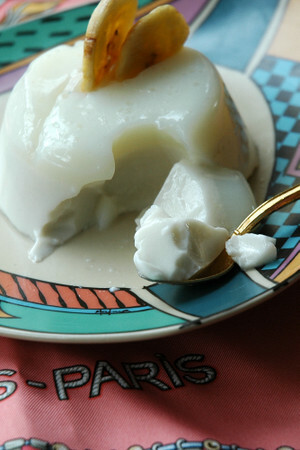 Panna Cotta can be made with several different gelling agents with the most popular being gelatin. 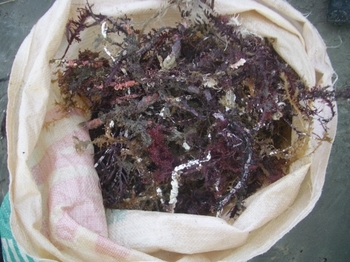 Vegetarians prefer to use agar which comes from this red seaweed . Who knew, New Zealand had an agar industry. Certainly not me. There we were zipping along the Ahipara end of Ninety Mile Beach when we came across this lady. So I stopped for a chat and discovered she was collecting seaweed which she then sold to be processed into agar. Along the shoreline, at least an hour by sand buggy from civilisation, are a series of old tin shacks which house the seaweed pickers. It would be a fantastic place to live in summer but cold and miserable in winter. 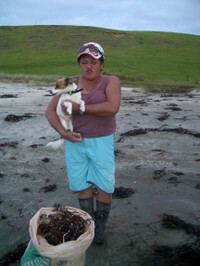 This particular woman didn't live in the area but had a normal house and nine to five job in Kaitaia . She just enjoyed fossicking on the beach on her days off. So why not fill up the back of her four wheel drive with seaweed and make a little extra money. Although at $2 a kilo you'd need to collect a lot of seaweed. So congratulations to my wine drinking buddy Ben in Memphis who came the closest to guessing correctly. 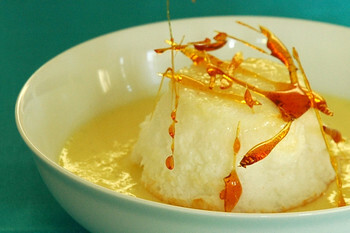 I used one of Heidi's recipes using agar in Panna Cotta from her book Super Natural Cooking . Lightly oil 6 ramekins and set aside. 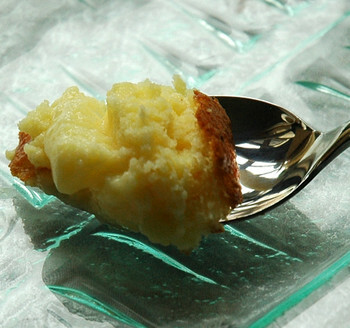 Place coconut milk, milk, sugar and agar flakes in a pan. Stir and let sit for 10 minutes to allow the agar flakes to soften and start to dissolve. This is important if you are using flakes. Very slowly bring the ingredients to a gentle simmer and continue to simmer for a few minutes, until the agar is incorporated. If it doesn't completely dissolve, pour the mixture through a strainer, pushing the undissolved agar through as well. (I didn't have any problems dissolving the agar flakes). Pour into ramekins and chill until set, about 1 hour. Ilva with the delightful Tuscan based blog Lucullian Delights is hosting a one off event - Show Us Your Apron. This became my favourite apron after I convinced the waitress at Shed 5 to sell it to me when I dined there ten years ago. No Prizes But Can you Guess What This Is? This week I'm planning on making a dish with an ingredient that started out here. Can you guess. I couldn't stay out of the kitchen a moment longer. Around 9PM last night I was craving something sweet but not too sweet, filling but not to heavy, and easy to make. My Lemon Delicious is usually pretty good but this one was outstanding. So good we ate it without any cream poured over it. The recipe has been adapted from Stephanie Alexander's book The Cooks Companion. I reduced the sugar and upped the lemon. So with a little help from Bryan the sous chef here it is. (He is possibly the only sous chef expected to do the washing up). Preheat oven to 180C and butter a 1 litre oven proof basin or serving dish. In a medium bowl cream butter, sugar, lemon zest and egg yolks. Add flour and milk alternately to make a smooth batter. Whisk egg whites until firm and fold gently into batter. Pour batter into prepared basin. Stand basin in baking dish and pour hot water to come half way up sides of basin. Bake for 50 minutes in fan oven or 60 minutes in regular oven. Later this year we will be spending a few weeks during October and November in Australia. Most of our time as always, will be spent in Queensland, but perhaps we should revisit old haunts and explore new spaces. I've always loved Melbourne. How can you not love a city where you happily drink champagne from a water tumbler while the group at the next table sing happy birthday to you when they discover it is your birthday. And it's even more special when you then discover they are the musicians from Phantom of the Opera and they happen to be dining in the same little Italian café before the show. 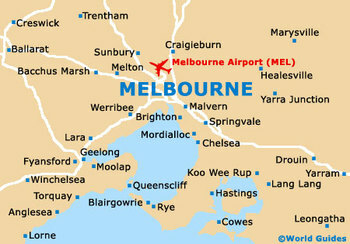 So it is some years since we last saw Melbourne and we've never been to the Mornington Peninsula. I only have a small percentage of readers in Australia and possibly not many of them are from Melbourne but perhaps you've been and would like to recommend a few favourite non tourist experiences (especially anything involving food and wine) I might enjoy. We are thinking of staying near St Kilda Beach so I can continue my daily walks on the beach....and there are lots of cake shops for when I need coffee and cake. 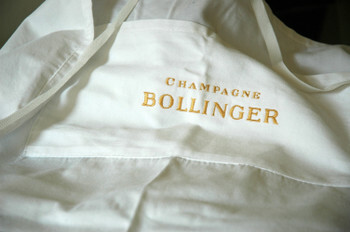 One of my most special friends lives in Bendigo and we will visit her and check out any vineyard suggestions you have. Mornington Peninsula is another vineyard destination I'd like to know more about. It will be a few days before I'm baking. Happily everything went well and I'll be as good as new in a few weeks. Thank you everyone for all you wonderful messages and support over this past week. You really make my life special.